L-R: Cllr Patricia Walker, Acton Central. Dr Tristram Hunt MP. Dr Rupa Huq. Labour's parliamentary candidate for the Ealing Central and Acton (ECA) seat is a 'true community champion' according to one of the party's bigwigs. Dr Rupa Huq who's hoping to oust Conservative Angie Bray next year says there should be more 'ordinary' people in politics. 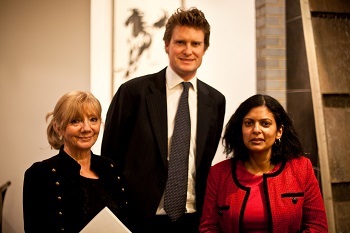 The shadow Secretary of State for Education, Dr Tristram Hunt, travelled to Ealing to support Dr Huq in her parliamentary bid. “Labour faces a huge challenge after we lost the support of the electorate in 2010. Under Ed Miliband the Labour Party has changed - we have excellent candidates like Rupa, moving Labour to a party rooted in our communities. ''There aren’t enough local, ordinary people in parliament. I’ve lived in Ealing for 40 years. Much of my family lives here too. I want to stand up for my neighbours and their families as well. Dr Huq also outlined her plans to take the election to the government door-to-door and fight for every vote. Ealing Central & Acton is 56th on Labour's 106 target seats for the 2015 General election.